My intention was to taste them all side by side, but it was impossible. 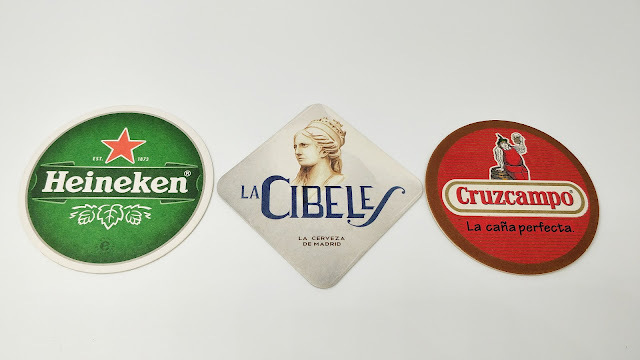 One of them is already retired: Cervesera Costa de Barcelona was founded in 2012, releasing their first and only beer Quatre Punts. After a couple of batches, in 2013 they quit selling beer. They were gypsy brewers, so it didn't involve much more than ceasing their activity. It was nothing special, but I can recall a decent enough caramelly to light toasty beer, with little hoppy presence and a bit too much of alcohol for the style (5.5% ABV). Then there's a Mild Ale called Nits a la Fresca, brewed by Whym, in Girona. I couldn't get it nowhere in Barcelona, so there were just two beers left for my local Mild localisation. Luckily, I could taste both of them to write the present post for the current session. I drank the first one during my birthday celebration, in Cara B along with the brewers from Edge Brewing and Guineu. The beer is made by Ratpenat (it means bat), and it's called Jornal. It is a pretty good example of a classic British dark Mild Ale, with its drinkability, toasty touches, chocolate, floral hops and a slight nutty aftertaste. It could easily be mistaken as an English brew if it wasn't for its carbonation, which is lively for the style. I was happy to taste it again, as it has evolved pretty nicely since the first batch. Good job. During the same weekend, I grabbed a bottle of the first beer we got in our beer scene that was labelled as Mild. I easily found it in the beer shop I usually go, in Barcelona. Still, Bleder Espurna de Drac is not exactly what I'd call a Mild Ale. It is light golden, quite carbonated and prickling, and has a very low malt presence. Maybe as it warms it gets a subtle nutty and grainy taste, but that's about it. It is, otherwise, a refreshing fruity beer, brewed with dry figs. Quite easy to drink once you get rid of the initial carbonation, and very tasty despite its 3.9% ABV. Although it has nothing to do with the present Session topic, I'd like to add that Fortiverd (the company brewing Bleder) has recently transferred their business to some still-unknown buyers, so that's probably the last beer I drink from them. It feels strange because it was one of the first microbrewers to launch their business, back in 2007. The bad thing is that this circumstances haven't been due to business, but to other unpleasant circumstances. So from here I send a big hug to Salvador and Presen, wishing them good luck from now on, while also thanking them for their contribution to our local beer scene. So, after drinking the only two Milds I could find for the present edition of The Session, I think that the only conclusion I can get is that there is not a single particular local Mild Ale feature. Milds are not popular here, as our new beer scene is more prone to hoppy stuff. My prediction is that maybe in a couple of years some similar beers could appear though, as low alcohol beers are getting increasingly popular lately. But until then, I'll have to keep dreaming about those deliciously subtle, moreish dark Mild Ales I have had the pleasure to session in the past, mostly in Welsh pubs. It is hard to love a style you can hardly get where you live.